It's no secret: I hate the New York Knicks. I also hate Patrick Ewing, in particular (no surprise there). Naturally, I have my favorite and preferred teams...but the funny thing is, there aren't very many teams that I dislike enough to root against; there are even fewer that I loathe with depthless abhorrence (see: New York Knicks and Philadelphia Phillies). A recent conversation with my buddy Cosmo and pitcher Cliff Lee's decision to sign with the Phillies have made me reflect on just why I feel the way that I do about these teams and, specifically, how team preferences are born. The first sports team that I ever knew anything about was the New York Mets. My Dad is a Mets fan and my first baseball game, unsurprisingly, was a Mets game at Shea Stadium. I've always looked up to my Dad and so it's no surprise that the Mets became my favorite baseball team. The interesting thing here though is that my Dad's not a terribly huge sports fan (by comparison--some men live and die by their teams, wear various team paraphernalia throughout the year, and watch or attend games religiously) but his interest in the Mets was enough to get me on board. Though I attended far more Yankees games with friends and family members than Mets games through the years, my dedication to the latter never wavered. Speaking of the Yankees, you would think that I would hate them because I root for the Mets...but that's not how I roll (nor is it how I've rolled throughout the years). I remember lying on my parents' loveseat in the living room in 1996 holding my breath as the ball sailed skyward with Charlie Hayes trailing beneath it, ultimately catching it and giving the Yankees their first World Series victory of my lifetime. I was thrilled; it was the first post-season experience I can remember having and I'll never forget the buzz and excitement in the city and in school over the whole run that the Yankees had that year; my Dad wouldn't be caught dead rooting for the Yankees. I've grown up in a kinder, gentler time of baseball fandom. My Dad's generation (and that before his) employed an "us or them" mentality when it came to rooting for teams. First of all, you rooted local--there was no question there. Second, you had exactly three choices: you rooted for the Giants, you rooted for the Dodgers, or you rooted for the Yankees; that was IT! In fact, many Mets fans became such solely because the Giants and Dodgers left town and they had no other choice (because once you went Giant or Dodger you NEVER ever went Yankee). I've never been one to follow the crowd and I think that's what has led to my selection of favorite teams. The Mets aside, I have quite the eclectic mix of preferred teams but I also have rational explanations for my selections. Let's start with baseball. I am a Mets fan who enjoys post-season baseball and thus I will root for the Yankees in October and November. My favorite player growing up was Gary Carter because he looked like a character from my then-favorite show (Mark Lynn Baker from "Perfect Strangers"--it was probably just the curly hair). The only team I can't stand in baseball is the Phillies; the only player, Jimmy Rollins. He's an arrogant prick and he plays for a team that likes to think that they are the Yankees of the National League. It's funny what one World Series run will do to a team, isn't it? Football is next and is perhaps the most bizarre in terms of my preferred teams. My favorite team is the Minnesota Vikings and has been since I was a kid. The reason (as far as I remember) is because they were featured frequenly on the television show "Coach." I don't remember what drew me to them, in particular, but I know that when I first started getting into football I rooted religiously for the Vikes. My second favorite team is the Carolina Panthers, though my reasoning here is a little more disjointed. See, as a kid, I was always a sucker for expansion teams; I thought it was the coolest thing when a new team would come into existence. It's why I rooted for the Marlins and Rockies (I out grew it by the time the Rays and Diamondbacks came about), the Raptors and Grizzlies, and the Panthers and Jaguars. Though I rooted for all of these teams, I wasn't necessarily a fan, per se, nor were they vaunted into my realm of favorites...at least none except the Panthers. That didn't happen until Jake Delhomme became their quarterback. I loved the way he played and when they made their Super Bowl run in 2003/2004 and was crushed when they lost to the Patriots. Interestingly enough, Jake Delhomme still holds the record for the longest past in Super Bowl history (85 yards) and has a plaque for it at the Hall of Fame in Canton. My Dad has been a huge Denver Broncos fan for time out of mind. 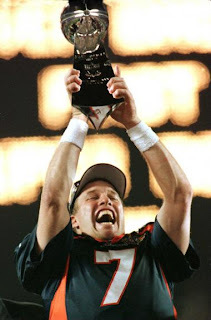 John Elway will forever be my favorite quarterback and I have a special place in my heart for the Broncos. Seeing them FINALLY win it all and my Dad's satisfaction as a result was a truly remarkable experience. It was my first experience with having someone's "team" go all the way. Though I obtained my gratification vicariously, it was still a thrilling experience nonetheless. The only NFL team that I hate with a passion is the New York Giants. I hate them almost as much as the Knicks...and for almost the exact same reasons (the similarities are eerie in their quantity and type). I must first explain which teams are my favorites in the NBA as this will help set up the Knicks/Giants explanation. I first got into basketball in 1995/1996. Someone had told me of a player named Muggsy Bogues who was five-foot-three--the same height that I was at the time. I couldn't believe that a player that short was able to play and have some degree of success in the NBA. It gave my burgeoning hoop dreams new life; if he could do it, then maybe I could too! Bogues played for the Charlotte Hornets and I became an instant fan of the team. I liked the colors, the mascot, and, eventually, the other players (Alonzo Mourning, Larry Johnson, Dell Curry, and Glen Rice to name but a few). The first full season that I was into basketball (following it daily) was the 1996/1997 season. The Hornets made the playoffs and I was stoked beyond belief. They were favored to do well in the playoffs, finishing third in the Central Division behind Michael Jordan's Chicago Bulls and the Atlanta Hawks. Things were looking great...until the playoffs started. The Hornets' first-round matchup was with the Knicks...who swept them 3-0 to take the round. I was crestfallen. I had never had a team that I rooted for so fervently make it to the post-season (the Mets and Vikings had little in the way of sustained success between when I started rooting for them and that point in time). As I tried to soak it in I was stunned. More than that I was crushed; the Knicks had ripped my heart out and stomped all over it with Patrick Ewing leading the way. Then, something funny happened. I broke out of my emotional coma and found that I was filled with rage--an unquenchable fire that demanded justice. Enter the Miami Heat. Aside from the Vikings, there is no other team that I root for with as much enthusiasm and dedication as I do than the Heat. Anyway, at the time, my best friend was a big Knicks fan (he still supports them but not with nearly as much interest) and seeing his smug glee at the Knicks advancing made me want to see his team lose that much harder. And not just lose but to be eviscerated--embarrassed and shamed off the court. Basketball was a game that allowed me to focus all of my competitive energy and my perfectionism. It didn't require me to have friends (of which I had relatively few growing up) or to rely on other people in general to play. It didn't require much in the way of equipment (more than a few Christmas and birthday presents were basketballs simply because I wore them out so quickly). As I said, it became my life and, consequently, it became my identity. I began to collect basketball jerseys from every team and I remember my sophomore or junior year of high school wearing nothing but said jerseys for over a month: a different one every day (incidentally, I also wore shorts to school just about every day, winter included, because a) I knew I'd be playing basketball at some point during the day and b) the heat was so wickedly hot in school that if I wore pants I'd be sweating my brains out for the entire day. My logic was as follows: I'd be outside for five or ten minutes waiting for the bus (which would be heated), another five walking from the stop to school, another five or ten waiting for the bus in the afternoon, and then another two minutes walking home. A half an hour of possibly being cold versus six hours of definitely being hot? It was a no-brainer). Anyway, back to Miami. Tim Hardaway was my idol in terms of my basketball game. I wanted to shoot like him, pass like him, layup like him, and, most of all, dribble like him. I've never been able to do the Killer Crossover ( http://www.youtube.com/watch?v=V0HRPIu02Xo ) quite like him...but it's serviceable. So the Eastern Conference Semifinals start...and the Knicks win game one. Then they go up a commanding three games to one going into game five...and that's when my identity as a Heat fan was soldered. Anyone watching that series remembers the P.J. Brown/Charlie Ward fight that led to the controversial suspensions...and the Heat winning games five, six, and seven. They beat the Knicks and took the Atlantic Division crown from them in Pat Riley's second year in Miami. Did I mention that he left the Knicks for South Beach? I hope it still hurts, Knicks fans. 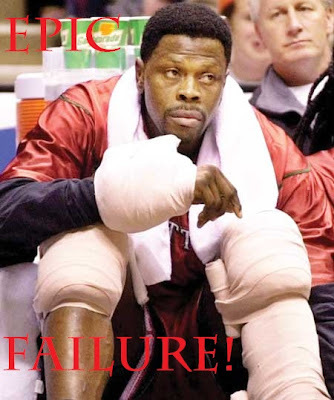 So for as much as I loved Tim Hardaway's game I hated Patrick Ewing's equally. He had one of the ugliest jump shot forms in the history of basketball (ditto for free throws) and was as ungainly as they come. Worse, he was revered by Knicks fans. To this day I take no greater satisfaction from nearly anything in sports than I do from the fact that Ewing never won a ring. In his defense though, the Knicks proved what a classless organization they are when they let him go rather than re-sign him despite his diminishing talents (like the Yankees with Jeter) or convince him to retire. It's still odd seeing the big man in a Magic or Sonics uniform. Anyway, back to the NFL. So in 2000 the Vikings were flying high. They had two PHENOMENAL talents in Daunte Culpepper (a QB bigger than a linebacker) and Randy Moss (arguably the greatest deep threat receiver in the history of the league). This is without even mentioning Cris Carter and Gary Anderson. In 1998 the team had set some crazy offensive records and lost in the NFC Championship game because of some poor kicking. 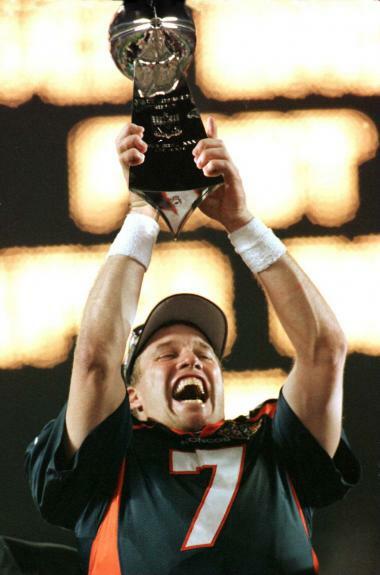 The upside of that, though, was that the Denver Broncos won their second of two back-to-back championships and John Elway retired as a two-time champ and one-time Super Bowl MVP. Things were going great...until the NFC Championship Game in 2000. I had been crushed in '98 when the Vikings had a Super Bowl bid in their grasp but this was going to be the year they redeemed themselves. After all, I had never watched my favorite team play in the big dance despite their having made four appearances historically. So what happened in 2000? The Giants beat them 41-0 only to go on and lose to the Ravens by an anemic 34-7. I hated the sudden vociferous vocality of Giants fans and I hated the fact that a less talented team beat my esteemed Vikings. Enter Eli Manning and further said trash talking by the Giants' fans. I hated Eli's "Aw shucks" Goofie "GAWRSH!" speech and his equally inbred style of play. Somehow, though, despite his awkward looking style of play, Manning managed to complete passes and have success (Patrick Ewing anyone?) Until 2007, though, his success was shortened in its scope. Enter the undefeated New England Patriots. I'm not a fan of their team but I AM a fan of record-setting statistical performances. Needless to say, I wanted to see a 19-0 season. The ending to that Super Bowl will haunt me forever. Effin' Giants! I bring up all of this because I now have a son who, presumably, will be into sports as he grows up. I am excited because I developed such a strong interest in athletics without necessarily having that interest fostered by my Dad. My hope, then, is that Timmy will be an even bigger sports fan than me simply because of my high level of enthusiasm. I'm looking forward to seeing what sports and what teams he favors and how he comes to his own conclusions. Will he be a Heat, Mets, and Vikings guy? Part of me hopes so...but the bulk of me wants him to have his own teams to root for. Hopefully it's not the Knicks, Phillies, and Giants...but if it is, at least it'll make those particular games that much more fun to watch!